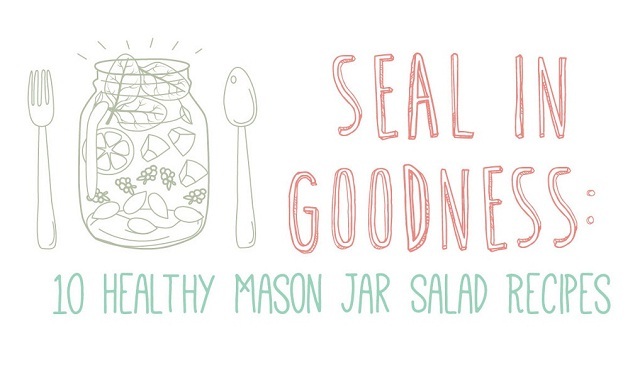 Seal In Goodness: 10 Healthy Mason Jar Salad Recipes #infographic ~ Visualistan '+g+"
Mason jar salads are a healthy, portable option for lunch! It makes meal prep for the whole week a breeze. The general rule of thumb to maintain freshness and prevent sogginess is to pack wet ingredients on the bottom (dressing always first), and dry ingredients near the top. Layer in order of moist to dry. The following recipes are ordered from bottom to top. If the recipe says “serves #”, divide ingredients listed equally between a corresponding number of jars. Feel free to experiment by swapping ingredients and creating whole new recipes! We would love to hear about your favorite salad combos, so please tweet us!